Support your back better with the Raynor Ergohuman Chair model LE10ERGLO. 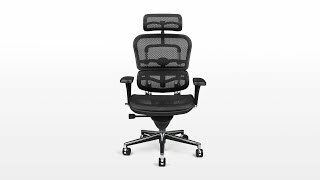 This chair brings you closer to your ideal working comfort, with high-end features including height adjustability, constant back and lumbar support with built-in flexzones, and a single-paddle mechanism for easy adjustments when you need them. You get all of this in a fully upholstered seat that promises to assist you throughout your tasks, much more comfortably. The Ergohuman Chair comes packed with ergo-friendly features, like adjustable arms that pivot inwards in addition to synchro-tilt, a sliding seat, and easy pneumatic adjustments to get you to that working sweet spot within seconds. Upgrade your seating situation and feel your comfort levels increase instantly. Chair is pretty good but the casters are cheap and broke the first year. $708.00 List Price: $1,329.00* The list price is the same as the MSRP (Manufacturer's Suggested Retail Price). It may not necessarily be the price at which the product is sold.